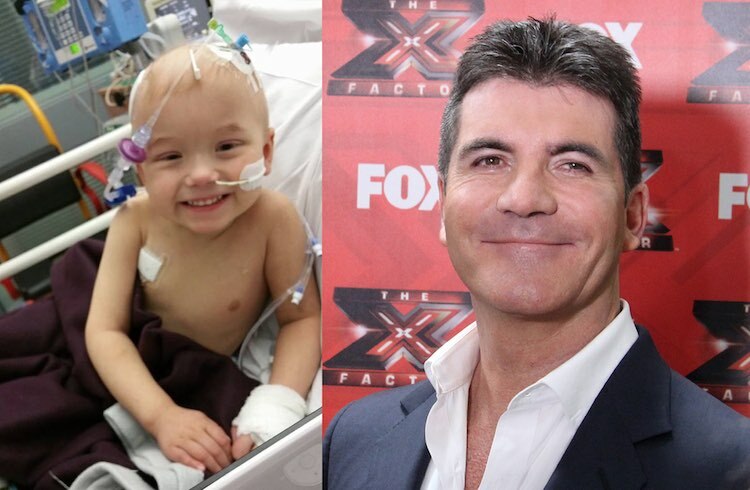 Reality show creator and star Simon Cowell has made plenty of people cry with his harsh, talent show judgements over the years, but one mother of a little boy fighting cancer cried tears of joy over his gift to her son. Three-year-old Kian Musgrove is battling an aggressive form of cancer for the second time in his young life. His family in the UK has been trying to raise $700,000 for special cancer treatments in the U.S. They were nearing their goal when the brash judge on shows like “The X Factor” and “American Idol” heard about the little boy’s plight. Cowell phoned Kian’s mother, Kat, telling her he’d give $35,000 (£25,000) toward the treatment and pay for the flights to and from the clinic in New York. Cowell also appealed to his 12.5 million followers on Twitter to help raise the remaining $100,000 needed for Kian’s treatment. Kian Musgrove is a truly brave young boy. I have just spoken to his mum. You can see the family saying ‘thank you’ in the video below, and follow Kian’s progress at the Caring for Kian Facebook page and donate online at his Kapipal page.